All four seen as important military or nuclear threats to U.S.
WASHINGTON, D.C. -- Americans are less likely than ever to agree on which country is the greatest enemy of the U.S., but the four countries that crowd the top of the list this year are the same as in Gallup polls in 2014 and 2015: North Korea (16%), Russia (15%), Iran (14%) and China (12%). Americans are continuing last year's trend of identifying a wide array of entities -- including, for the second year in a row, the Islamic State group -- as the United States' greatest enemy. At least 5% of the public named one of six different entities -- five nations and the Islamic State group -- as the top threat. Though the responses are more dispersed, there is continuity at the top. North Korea, Iran and China have consistently ranked high on the list of enemies, dating back to 2005. Americans have not as consistently regarded Russia as the greatest U.S. enemy, but that nation led the list last year. Gallup's February World Affairs survey features two other updates on Americans' views of foreign countries: favorability ratings and the perceived economic and military threat that a country poses. 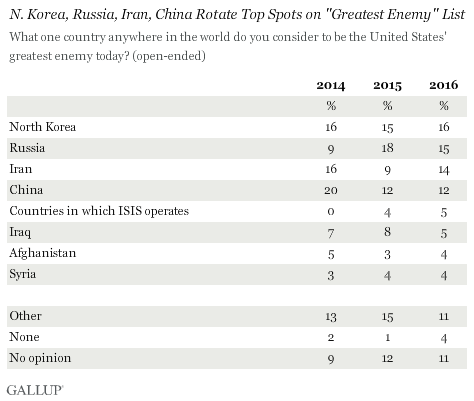 A majority of Americans view each of the four countries at the top of the "greatest enemy" list unfavorably. Majorities also see each of the four as threatening the U.S. through military power, economic power or the development of nuclear weapons. But the basic ratings of the countries are not monolithic. Americans are more than five times as likely to have a favorable opinion of China (44%) as to have one of North Korea (8%). Likewise, they are almost twice as likely to consider the development of nuclear weapons by Iran (75%) as a "critical" threat as they are to see Russia's military power (39%) that way. North Korea: The nation named most often as the greatest U.S. enemy this year also has the most unfavorable rating of the 21 countries and territories rated -- and has had the lowest rating for three straight years. A majority of U.S. adults (58%) regard its military power as a "critical" threat. Russia: Only four years ago, half of the American public viewed Russia favorably, and only 2% viewed it as the United States' greatest enemy. But a series of events pitting the U.S. and Russia against each other has soured the relationship. Only 30% now have a favorable view of Russia, and 86% regard Russia's military power as either an important (47%) or a critical threat (39%). Iran: Iran topped the "greatest enemy" list five straight times from 2006 to 2012. China moved ahead of it on the 2014 list, as the percentage naming Iran fell from 32% in 2012 to 16% in 2014. It shrank again to 9% in 2015 before the slight increase to 14% this year. Meanwhile, Americans are only slightly more likely to view Iran favorably now (14%) than they were in 2012 (10%), and 75% think the development of nuclear weapons by Iran constitutes a critical threat to the U.S.
China: A slim majority of Americans (52%) view China unfavorably, but 87% view its military power as an important or critical threat to the U.S.; 86% feel the same about China's economic power. Though no one country dominates Americans' thinking when they are asked to name the United States' greatest enemy, they most frequently mention North Korea, Russia, Iran and China, and all have ranked highly in recent years. For the past two years, strong majorities of Americans have seen each of the four as threatening to the vital interests of the U.S. in some way -- the military power of Russia and North Korea, the military and the economic power of China and the threat of nuclear weapons for Iran. With almost three-fourths (73%) of the public thinking all four nations are, at the least, an important threat to the U.S., the reason no single nation is thought of as the greatest enemy may not be because Americans see so few threats, but because they see so many. More Americans continue to believe China is the world's leading economic power rather than the U.S. At the same time, Americans have newfound confidence that the U.S. could regain that title within 20 years. Americans' negative views of Syria have grown, as four in five adults now say they have an unfavorable view of the country -- a new high in Gallup's trend. Now only North Korea has a worse image among Americans than Syria. 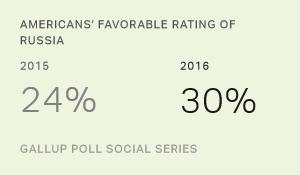 Americans view Russia slightly more favorably now than they did in 2015, yet these favorability ratings are still half as high as they were a decade ago. 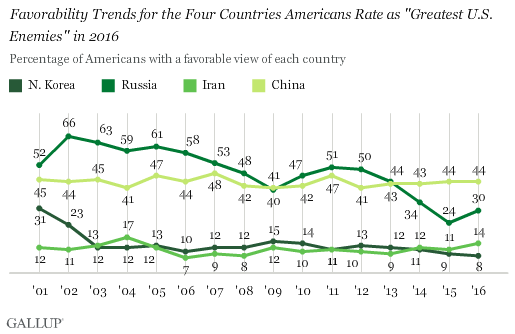 U.S. adults also are less likely to see Russia as a critical threat to the U.S.